tamtagon wrote: City within an Airport, terminal adjacent development that appeals as a destination to locals, SouthCentral US regional transportation hub built enticing domestic travelers to join international travelers to spend the night before continuing on... the spread-out horseshoe design will become host to the next evolution of American airports. If we're lucky, DFW will get out ahead of all/most other US superhubs to update our air service infrastructure. Delta stopped giving an NRA discount; in retaliation, the Georgia Lt. Govenor threatened to take away a fuel tax rebate gifted to Delta. So now, of course it's politics!, places are offering themselves to Delta as a new home. Now, neither of the North Texas airlines had an NRA discount. That's nothing to do with any of this, but I'm just saying it. The deal is Delta moves it's HQ to Dallas, and in a shocker to the rest of the world, commits at least two thirds of its Atlanta flights to DFW with the build out of three new domestic terminals and one new international terminal. The move makes DFW the foremost global alliance hub in the world with Skyteam and Oneworld. It seems like this mixture of international and domestic in the same space is something DFW will be able to accommodate easily considering they are planning further major changes at our older terminals. The new terminal they are discussing could integrate these things and move that project further along faster to be competitive and affect the design plans for the complete replacement of the older terminals they have also been discussing lately. cowboyeagle05 wrote: It seems like this mixture of international and domestic in the same space is something DFW will be able to accommodate easily considering they are planning further major changes at our older terminals. The new terminal they are discussing could integrate these things and move that project further along faster to be competitive and affect the design plans for the complete replacement of the older terminals they have also been discussing lately. DFW already mixes international and domestic in the same space (Terminal D). There is nothing particularly revolutionary about what is being proposed for O'Hare. American Airlines is adding service to Oaxaca, Mexico from Dallas. Has anyone heard any peeps on the new DFW long term plan? The more I think about it, the more I am in favor of planning for an eventual brand new centralized terminal on the south side of the current airport property, shutting down International Parkway. I'm envisioning a world class facility built on the south end of the airport property, with a large central check in and security area, leading to a shopping/dining/hotel complex area with 4 or 5 massive concourses fanning out from there, with about 200-250 gates and rapid people movers connecting them. Terminal D and existing parking garages could be connected to the main domestic terminal by Skylink (separate sterile and non-sterile lines) and continued to be used, connecting to the central check-in/security area. Eventually, a new international terminal could be built midfield or on the north side, again connected by train to the domestic area. It would simplify and strengthen the AA hub and make for a better experience for both O&D and connecting passengers. Expensive, but it would be a step forward in keeping DFW a superhub and expanding it's dominance. American is paying to renovate the E Satelite and will move flights out there. That’ll make for a long connection out there but cool to see that those gates will stay utilized. The airport is looking into fluctuated pricing for terminal parking, a-la the express lane toll structure that LBJ Freeway now has. It hasn't been decided what range the prices will be. Considering how far out and inconvenient it can be to park at The Parking Spot locations or Park n Fly, I would be willing to park at the terminal for a couple bucks more. I'm tipping the drivers a couple bucks each way, so it's not like I'll be paying more to begin with. Love Field has terminal parking at $13 and $17 and have no problem filling them up. 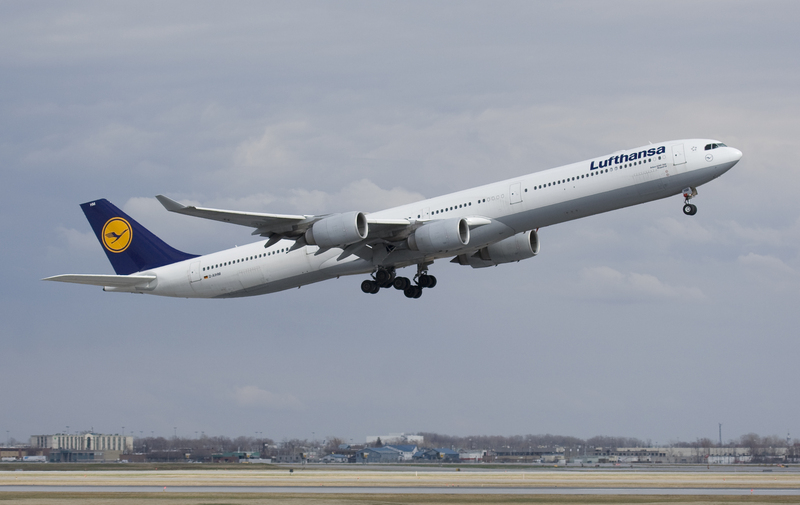 Lufthansa is upgrading from an A330 to an A340 in 2019 per Routes Online. Matt777 wrote: Lufthansa is upgrading from an A330 to an A340 in 2019 per Routes Online. Not really an upgrade. The two planes are structurally almost the same. Passenger capacities are about the same. Basically the 330 has two engines and the 340 has four, plus a center fuel tank the 330 lacks. The 340 has more range, but at the cost of guzzling more fuel. Historically the U.S. airlines were more comfortable with ETOPs and went with the 330 to save fuel, while the European airlines were more conservative and bought an extra pair of engines. The one time I took Lufthansa to Frankfurt they used a 340. Since either plane will do the job I wonder if they assign whichever model they don't have a specific need for elsewhere. I understand what the A330 and A340 share design wise, but this is an upgauge from A330-300 to A340-600 which means anywhere from 2-26 additional business class seats and up to 79 additional economy seats depending on the configurations of A330 they were using (I think it was the 30 seat biz class cabin from what I remember when I took them 1.5 years ago). So, it is quite an upgrade in capacity. Not to mention the cool lower deck lavatories accessible by staircase on the A340. The A340-600 is a long bird, longer than the A380 and was the longest passenger plane in production until the 747-8 came along. Aha. You left that little detail out. This is great news. Actually fairly surprising. Historically a lot of the DFW-FRA passengers has been on their way to India and its neighbors. The ME3 have been grabbing that traffic, to the point that a couple years ago the discussion was whether or not LH might drop DFW. To see a Star Alliance airline adding capacity to a Oneworld hub with all that competition is an incredibly good sign for the DFW market. IINM, this is the first time either carrier has served DFW. I'd love to see them survive to next summer, but it will be tough with AA offering seasonal daily service. I'm surprised there is enough demand in Del Rio for service. Tnexster wrote: I'm surprised there is enough demand in Del Rio for service. It's probably a government subsidized route that falls under EAS (Essential Air Service). Yes, it is EAS subsidized. The route is primarily to serve military members traveling to/from Laughlin Air Force Base. I've always thought Del Rio must be such a 'unique' place to live, like totally weird. Seems so strange, surprising that the Rio Grande Valley is muggy so much of the year, but doesn't rain. Makes sense when you think about it, though, it's a river valley, and air movement is slow-de-slow, not quite a desert. Somewhere along the line, I ran across statistics saying something like when the factors are temperature, humidity and air movement Laredo area is the hottest place in the world. I've always wanted to truly understand life along the Rio Grande. tamtagon wrote: I've always thought Del Rio must be such a 'unique' place to live, like totally weird. Seems so strange, surprising that the Rio Grande Valley is muggy so much of the year, but doesn't rain. Makes sense when you think about it, though, it's a river valley, and air movement is slow-de-slow, not quite a desert. Somewhere along the line, I ran across statistics saying something like when the factors are temperature, humidity and air movement Laredo area is the hottest place in the world. I've always wanted to truly understand life along the Rio Grande. Don't ever tell someone from the Rio Grande Valley that Del Rio is in the RGV, haha. It's 4-5 hours north of the RGV on the river but I can see what you mean by "river valley." I grew up in the RGV. It has a very unique culture but you're not missing much. It's actually a very safe place according to crime statistics but there isn't much to do other than go to South Padre Island, shop, and eat very good/crazy/unhealthy food. Storms last night likely gave AA's inaugural DFW-KEF a rough start. The airport had 75 diversions yesterday, and the flight got delayed almost 16 hours to a noon departure today. flyswatter wrote: Storms last night likely gave AA's inaugural DFW-KEF a rough start. The airport had 75 diversions yesterday, and the flight got delayed almost 16 hours to a noon departure today. Yea, I was on that inaugural flight to KFE with AA. About 30 minutes before boarding they announced that we would have to stop in Bangor, ME to refuel. Once we boarded, they discovered there was a broke fuel pump so we sat there for a little over an hour before telling us that we needed to get off and wait an hour for another plan coming in. After about 20 minutes they told us the 8:20pm flight was delayed until 1am because they had to get a new flight crew. Around 11pm they came back and said that they couldn't get a new flight crew so our flight was delayed until noon the next day. Left at Noon the next day and luckily didn't have to refuel in Maine and made it to Iceland at 1am Saturday morning instead of 9:30am Friday morning. Good to hear Icelandair was able to take off without a hitch. Flew them last time going to KEF, will probably use them going forward. This is a pretty cool graphic representing 24 hours of worldwide air traffic. You can literally see the hive of activity that the Dallas area is in the graphic with DFW and Love Field airports. Starting in September, DFW will not allow those picking up passengers to idle or wait at curbs in front of a terminal. There will be special 1-hour and 2-hour spaces in nearby parking areas available for those waiting for passengers. Anything curbside will become loading/unloading zones. Transportation services may find their curbside places rearranged in the coming months. This plan is similar to what goes on at other airports, including Love Field, and should ease any traffic congestion that forms in front of terminals at DFW. jrd1964 wrote: Starting in September, DFW will not allow those picking up passengers to idle or wait at curbs in front of a terminal. There will be special 1-hour and 2-hour spaces in nearby parking areas available for those waiting for passengers. Anything curbside will become loading/unloading zones. I was at JAX once picking up a coworker who arrived on a later flight and pulled to the curb as she was walking out of the vestibule from bag claim, only to be told I had to "go around and wait until the person I was meeting was standing at the curb." Being literally feet away from my car was not good enough for that traffic cop, apparently. I get that they needed to do something, but if you're going to enact a policy that requires enforcement, why not just punish/fine the most egregious offenders (the ones who turn off their car and get out, stop/park in lanes other than the curb, stop in the wrong areas, take too long to load, etc)? Those are the people causing traffic snags, not the drivers who arrive 5 minutes earlier than planned to pick up somebody. flyswatter wrote: lol all because you had an obnoxious cop in JAX doesn't mean it's the same everywhere. Never had a problem at any other airport, even at super aggressive MCI cops or the overcrowded DAL drop off/pick up zones. I'm actually really surprised DFW still let you loiter at an airport entrance. That's my point- you saying you've never encountered aggressive enforcement at other airports shows how arbitrary those rules are. If anything, it will just cause more people to inch along or continuously circle the roadways to kill time. I'd happily use the 1-2 hour parking every time if it meant DFW knocked a buck off the entrance toll as incentive, but otherwise it's not worth the bother unless I know I'll be waiting 10+ minutes for the person I'm picking up. When is the updated Masterplan suppose to debut? I haven't seen a new masterplan, but this very informative document below was released last month. It includes information about a 4 gate/150,000 square foot expansion of Terminal D that is kicking off (page 56). Matt777 wrote: I haven't seen a new masterplan, but this very informative document below was released last month. It includes information about a 4 gate/150,000 square foot expansion of Terminal D that is kicking off (page 56). Something else I found interesting in the projects up for bid was the $6.5 million, 9,000 square foot "VIP Lounge Area" with capacity for 70 people in Terminal D. I wonder if this is a new lounge for one of the airlines already there, for a new airline, or to be a general lounge to be used by multiple airlines. Japan Airlines thinks they need a dedicated lounge before they can introduce First Class and larger aircraft. Or it could be a new entrant, like Singapore or Cathay Pacific. DFW will get federal funding totaling $180 million for 2 taxiway projects. One will take 3 years, the other will be complete in 5 years. Elaine Chao, US transportation secretary, visited DFW last Friday with the news. Trammell Crow to be involved in the "Passport Park" warehouse construction project on the SE side of the airport. Cabs are feeling the pinch since ridesharing services started bringing alternative transportation to DFW. itsjrd1964 wrote: Cabs are feeling the pinch since ridesharing services started bringing alternative transportation to DFW. To taxis, I say good riddance! Especially in Dallas where they were always absolutely terrible and useless. I turned 21 a few years before Uber hit Dallas, so when we'd want to go out drinking we'd all have to meet at one friends house, call a cab, wait for 30 minutes to an hour, and then deal with surly drivers charging obscene amounts of money for short rides and then demanding huge tips. One time, we waited for a taxi for an hour to get from The Village to near the Granada on Greenville Ave, a short hop. We tipped the driver $5 for this ultra short ride, on top of the hefty fare, and she flipped out and started cursing at us. Rideshare is not just easier and cheaper, but it is also more accessible and has cut down on drunk driving. BYE TAXIS. It is kinda like when Netflix/Redbox killed off Blockbuster and its terrible late fees. Piss off your customer base long enough and they will not shed a tear when your business model gets outdone by the next smartest guy in the running. Glad the Uber/Lyft regulations proposed by Yellow Cab were killed off by the Mayor and City Council back when they randomly showed up on the agenda. Sadly when it came to this bike share thing the city overstepped and killed off our new bike share economy. The scooters will be gone next because they city is only temporarily granting them free permission to operate until the trial period is over. I guarantee they will over-regulate those out of existence too. Taxi service could easily update it's function, but that would essentially replace the 'bosses' and owners with an entirely new structure, and as we've seen with companies across the industrial spectrum, those folks usually take the suicide pill rather than evolve. It's unfortunate for the workers cause they get nothing out of the deal, but the stubborn blind decision makers always make out with a strong retirement. And on another DFW daydream note, North Texas is strong and steady gaining population and workforce diversity; the level of multinational corporate decision making in area offices is increasing just the same. Shouldn't be too many more years before the international volume at DFW Airport gains more attention from a second airline alliance. American Airlines is adding the following seasonal nonstop flights from DFW on June 6, 2019! Both will be seasonal, daily flights on Boeing 787s. Matt777 wrote: American Airlines is adding the following seasonal nonstop flights from DFW on June 6, 2019! Happy to hear about the Munich route! The latest rumor on A.NET is that Air France will be starting a DFW-CDG route next year. Air France briefly served DFW right before Sept 11 2001, but pulled out shortly after 9/11 after the global decrease in air traffic. I hope the rumor is true and wish them success! My next prediction is someone serving DFW-Taipei, whether it be AA, China Airlines, or EVA Air. Matt777 wrote: The latest rumor on A.NET is that Air France will be starting a DFW-CDG route next year. Air France briefly served DFW right before Sept 11 2001, but pulled out shortly after 9/11 after the global decrease in air traffic. I hope the rumor is true and wish them success! Would be cool to see AA and EVA compete on that route. EVA already has freight services in DFW. DFW is the 13th U.S. market for Air France, which also serves Houston. The carrier’s parent company, Air France-KLM, is closely tied to Delta Air Lines through their membership in the SkyTeam Alliance and a trans-Atlantic joint venture, similar to American Airlines’ partnership with British Airways. Hopefully the seasonal schedule will show enough success to become permanent and more frequent. Interesting to see the difference between the airline list and their gates from then versus now. At least it will make the flights between Dallas and home much more convenient, and on Air France nonetheless! I just hope they won't follow the national tradition and be on strike every couple days. Worth noting that AA already offered DFW-CDG, but with far less onward connectivity. I'm not that enthused with AF's onboard product in coach, but at least it's an A330, which beats the heck out of their awful 10-abreast 777s they run to most other north American cities. Wild that A/C/E all used to only cover 2/3rds of the semicircle. A & E have been renovated such that you can't see the gaps where they completed the semicircles anymore, but C still has the narrow "mobile home park" gates tagged on the end, and now they're running their bigger domestic planes out of those gates so the crowding is even worse. I would love to see the rest of the article if you could upload a full scan. What's the date on the article? About four more pages of that brochure are gone now. I don't know the year. But google image searching Surtran taxis turns up interesting NYT and architectural articles about DFW opening and Dallas in general. Edit: btw, if anyone has job contacts in New York, PM me. I'm headed out there this week, courting someone. Thanks, all.